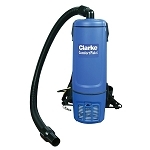 Clarke introduces two new backpack vacuum to the cleaning industry. These backpacks are built to last and come complete and ready to use. Increase productivity and and save on time and money with these backpack vacuums from Clarke.